Could Hybrid Cloud Computing Increase IT Efficiency in Boston? – Synivate, Inc.
A recent report revealed that over 90 percent of tech leaders claim that hybrid cloud infrastructure is the “ideal IT model,” however the same report also showed that only 18 percent of those surveyed are actually using hybrid cloud computing today. The primary benefits that were noted regarding hybrid solutions versus other cloud computing services include interoperability between cloud types, the ability to move applications back and forth between clouds, outranking cost, and security. All of those things seem like definite reasons to make a move to a hybrid cloud infrastructure, so why the huge gap between these claims and actual use? When all is said and done, the biggest reason why more companies aren’t moving to hybrid cloud computing is due to a startling lack of talent in this area. Recruiting and retaining IT technicians who can manage hybrid cloud models effectively to increase IT efficiency across the board has become increasingly difficult. Businesses need someone who has the skills, knowledge, and experience to manage their hybrid cloud infrastructure and the pool of individuals who can provide these services is quite low. In order to take advantage of all the benefits associated with these hybrid cloud computing services, companies need to find a professional solution that can provide them with the ongoing support that they require. When it comes to cloud computing services, there is no one-size-fits-all solution for every single business. Synivate works with each client to identify their needs to make smart decisions based upon the amount of security, encryption, and data that needs to be put in the cloud. When it comes to hybrid cloud infrastructure solutions, we can help you there too, matching your needs for software, hardware, IT operations, and security, along with growth expectations for the future. Once we identify the best solution for your business, we can help you to integrate it seamlessly into your existing IT environment. In addition to creating the backbone for your hybrid cloud computing solutions, Synivate can also provide fully-managed services. Businesses of all sizes can benefit from managed services, which can either enhance or replace an IT department to save you money, increase IT efficiency, and eliminate concerns about hiring and retaining qualified staff. We will work with you and your team to establish the best solutions and service programs designed to provide you with the best return on your investment. We can offer a wide range of services, including real-time data backups, 24/7 monitoring, and other critical management tasks. Most of the time we hear about public and private cloud computing services, but discuss very little about hybrid cloud computing. There are a lot of common misconceptions about hybrid cloud computing, particularly where the servers are located. 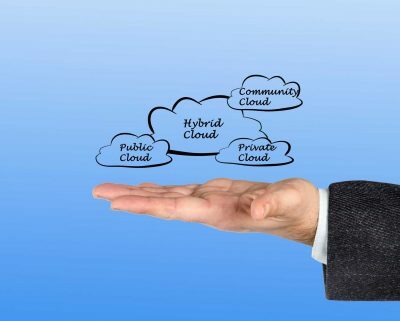 Some might view hybrid as keeping IT operations in-house while connecting to a cloud for data sharing, but the reality is that it refers to a system that utilizes both public and private cloud systems for its IT environment. The clouds are designed to operate independently of one another while communicating to increase portability of shared data and applications. Easy to customize, a hybrid cloud infrastructure provides companies with more growth potential to expand their business in the way that they see fit. Synivate works with clients to choose the best cloud computing services based on their unique needs and requirements. Adding security to cloud computing, regardless of the type, is an essential step to safeguard proprietary applications and company data. Security can also ensure better control over IT operations and even meet industry demands or government regulations with a specific level of required encryption. Our team can work directly with you to determine the best course of action for hybrid cloud computing and security to best meet your needs. Contact Synivate today to speak with one of our technicians about your interest in hybrid cloud infrastructure options or other cloud computing services. We can provide you with a complimentary development consultation that will help you to get the most out of your cloud computing experience, increase IT efficiency, and provide you with the best return on your investment. Call today at 617-517-0704 to reach the team at Synivate.